Kaklauskas. A., Zavadskas. 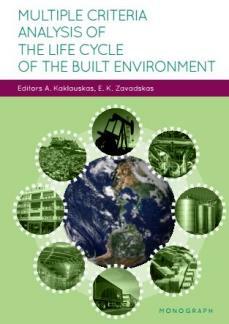 E. K.. (2015), Multiple Criteria Analysis of the Life Cycle of the Built Environment. Vilnius: Technika, 448 p. .
Authors‘ Affiliation: Head of the Department of Construction Economics and Property management at Vilnius Gediminas Technical University, Vilnius, Lithuania. He has a PhD (1990) and DrSc (1999) in Technological Sciences, Civil Engineering. He is a member of the Lithuanian Academies of Sciences. He is a member of international organizations and has been a member of steering and programme committees at many international conferences. A. Kaklauskas is a member of editorial boards of several research journals. He is author and co-author of more than 100 papers and a number of monographs. Research interests are: construction, decision analysis, business inelegancies and decision support systems. 2 Head of the Research Institute of Internet and Intelligent Technologies and head of the Department of Construction Technology and Management at Vilnius Gediminas Technical University, Vilnius, Lithuania. He has a PhD in building structures (1973) and DrSc (1987) in building technology and management. He is a member of the Lithuanian and several foreign Academies of Sciences. He is Doctore Honoris Causa at Poznan, Saint-Petersburg, and Kiev universities. He is a member of international organizations and has been a member of steering and programme committees at many international conferences. E. K. Zavadskas is a member of editorial boards of several research journals. He is author and co-author of more than 400 papers and a number of monographs. Research interests are: building technology and management, decision-making theory, automation in design and decision support systems. .